New Super Mario Bros. Wii is released this weekend, continuing the proud tradition of Princess Peach getting her delicate bottom kidnapped by lizard creatures. Let's explore her victimization record, shall we? Princess Peach gets kidnapped a lot. There are few women with more kidnappings under their belt than her royal mushroom highness, with only Daphne from Scooby Doo immediately springing to mind. In the 24 years of her existence, the good Princess has been stolen away at least a dozen times by Bowser and his pals, and we've got the documentation to prove it. 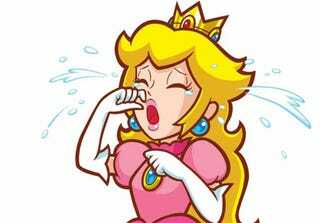 Princess Peach's first appearance in a video game also marks her first appearance as a victim of kidnapping. No one is quite sure where and how Bowser took her, but took her he did. A mutant turtle thing of vast resources, he even set up several decoy castles to keep Mario and Luigi occupied while he had his way with her. Thankfully his way equated to leaving her in a room, waiting for rescue. After a brief stint as a playable character in Super Mario Bros. 2, Peach was back to her being kidnapped ways. She initially sends out Mario and Luigi to halt her rumored kidnapping, but they ultimately fail, and Bowser gets his paws on her once again. At least she kept in touch. In Super Mario World, Bowser kidnaps Princess Peach again, only this time he does it using the power of the Super Nintendo. He parallax scrolls her away to Bowser's Castle for a lovely ride in the Koopa Clown Car. Special thanks goes out to our readers for reminding me about Super Mario RPG, where Princess Peach is indeed kidnapped by Bowser. Then she is kidnapped by Booster. She actually managed to get kidnapped twice in one game. Simply amazing. While being entombed in a fresco in front of your own castle isn't exactly being taken away from everyone you know and love, we're going to go ahead and call this one a kidnapping as well, just for the sake of being able to include it in our list. You got a problem with that? Don't make us entomb you in a fresco kidnap you. Not content to merely capture the Princess this time around, Bowser actually kidnaps her whole damn castle. Paper Mario featured scenes where you could control Princess Peach, gathering intel necessary to facilitate her escape. If only Bowser had stuck to his original 'leaving her in a room to be rescued' plan she'd probably still be kidnapped today, giving birth to little half-mushroom, half-lizard babies. Speaking of half-mushroom lizard babies, in Super Mario Sunshine it's actually Bowser Jr. that kidnaps Princess Peach, having been convinced by his father that she is his real mother. How did this game get released without Fox News and friends pondering the suggestion of Princess/lizard coupling? Why can't I stop pondering it right now? Who the hell are the X-Nauts? They're a species of alien led by one Sir Grodus who, despite our cultural differences, manage to work out that kidnapping Princess Peach is simply the right thing to do. Go X-Nauts! Unable to overcome his mommy issues, Bowser Jr. once again snatches Peach out from under Mario's nose in the New Super Mario Bros. for the Nintendo DS. He also raises his father from the dead during the story, which brings up the following question: If Bowser Jr. can reanimate the dead...wait, how the hell can he reanimate the dead?! I didn't say it was a good question. In this game, Princess Peach has to rescue a kidnapped Mario and Luigi. Obviously the whole thing was a dream. Back to the kidnapping! Princess Peach is forced to marry Bowser against her will (riiiiight) by the vile Count Bleck, which will somehow release the power of the Chaos Heart. Mario rescues her, she lures Bowser to the good side, and they all live happily ever after, never to be involved in a kidnapping plot again. Of course, if Princess Peach just happens to be in her castle when Bowser steals it and launches it into outer space, then that's something different entirely. You have to admire Bowser's logic though. If launching the castle into the sky doesn't work, just launch it higher. Epic fail, but brilliant.